How to scroll lock in a bash terminal on Xubuntu 18.04? During processing, I want to be able to disable (and enable again) auto scroll down to newest output so that I can examine the output before. I don't know whether what you want is possible "during processing", but before issuing a command, you can change the terminal's preferences via Edit > Preferences as seen in the image below. Most probably, just increasing the Scrollback value from the default should suffice. Going overboard may be an issue if you have limited RAM. 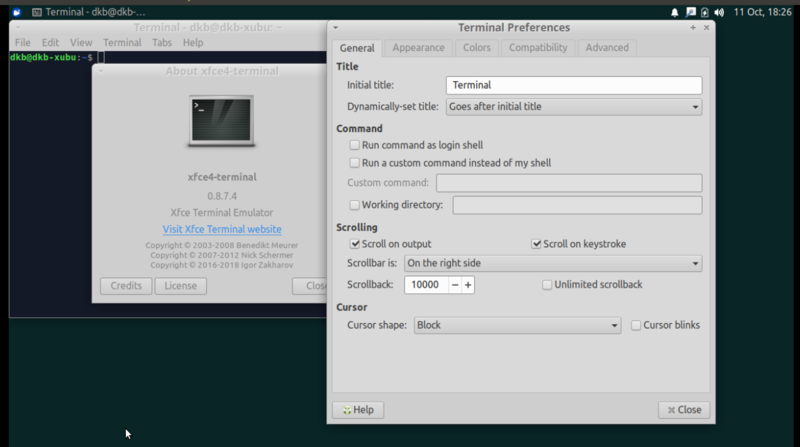 In case, you need a keyboard "toggle" to start and stop scrolling during a process running in the terminal, I'm not sure one exists at least in Xubuntu 18.04. Not the answer you're looking for? Browse other questions tagged shortcut-keys scrolling xfce4-terminal or ask your own question. Is there a way to scroll back in terminal to a specific command? Xubuntu 18.04: basic terminal emulator where the cursor blinks normally?